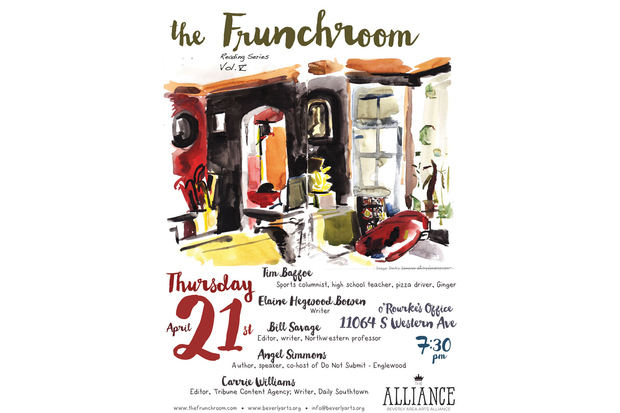 Five new storytellers will take the stage at 7:30 p.m. April 21 for The Frunchroom, a quarterly reading series. The authors will read their South Side-inspired texts at O'Rourke's Office in Morgan Park. MORGAN PARK — The Frunchroom marks its second year of storytelling at 7:30 p.m. April 21 at O'Rourke's Office in Morgan Park. The "live lit" event will feature five new readers telling South Side-centric stories at the bar at 11064 S. Western Ave. It's free to attend the quarterly series showcasing local storytellers. The event is coordinated by Scott Smith, a Morgan Park resident, in partnership with the Beverly Area Arts Alliance. This group also coordinates the annual Beverly Art Walk. • Tim Baffoe was born in Beverly. Now a resident of Mount Greenwood, Baffoe writes sports columns for 670TheScore.com. He's also an English teacher at St. Rita High School in Ashburn and proudly delivers pizza for Fox's Pizza in Beverly. • Elaine Hegwood Bowen grew up in Englewood. The veteran journalist lives in Bronzeville now and has written for Chicago Crusader since 1994. Bowen is the author of "Old School Adventures from Englewood — South Side of Chicago." The memoir details growing up in the 1950s in Englewood. • Bill Savage lives in Rogers Park and teaches Chicago culture at Northwestern University and the Newberry Library. Savage also works as an editor at the University of Chicago Press and co-authored "Chicago by Day and Night: The Pleasure Seeker’s Guide to the Paris of America" with Paul Durica. • Angel Simmons is president of The Message Inc. and a mentor at Aspirations of Life. She also co-hosts Do Not Submit: Englewood, an open mic storytelling series in Englewood. Her first book "Love’s Great Design" will be released this year. • Carrie Williams is a graduate of Mother McAuley Liberal Arts High School and Saint Xavier University, both in Mount Greenwood. She is also an editor at Tribune Content Agency and a freelance writer for the Daily Southtown and others. Williams is also the former managing editor of Today’s Chicago Woman. More information on the upcoming reading series can be found at thefrunchroom.com or at beverlyarts.org.